If you’re involved with the hiring process at your company, then hiring analytics should be the first thing you think about when sit down at your computer in the morning, and the last thing on your mind when you step out of your office in the evening. In fact, I’d go so far as to say that if you don’t have a solid hiring analytics strategy or you are completely in the dark about the value your company places on hiring analytics, then you’re being set-up for failure. The reason I feel confident in making such a bold claim is because hiring analytics are the framework for your recruiting benchmarks. If you don’t know everything there is to know about your candidate flow/new hires sorted through hiring analytics channels, then not only do you not understand your applicants, but you’ll have no way of measuring how well you’re actually doing relative to hiring. If you’re anything like our clients, designing an efficient hiring process can feel overwhelming! Before we get into the why’s of hiring analytics though, let’s start with what they are: hiring analytics are the EKG of your hiring process because they help you determine whether or not you’re on the right track with your hiring efforts. An EKG is used to determine whether or not the heart is pumping blood efficiently. If you’re meeting your company’s hiring needs, then your hiring analytics serve as tangible proof to your company that you’re doing what you need to in order to aid the company in its growth. Think of hiring analytics the same way your marketing team thinks about Google analytics because it serves the same function for you as it does for them – getting applicants (clients) to complete an application (buy). Of course a lot of the hiring analytics you track will be based on what both you and your company value, but a great starting place is to sit down and brainstorm all of the areas of your hiring strategy with which you can assemble data. In the beginning, more is better. Now that we’ve narrowed down a couple of the hiring analytics what’s, let’s talk about why. Hiring analytics help you map out your hiring process. If you’re anything like our clients, designing an efficient hiring process can feel overwhelming! Especially if you’re new to the hiring world. One of the most efficient methods for mapping out a hiring strategy that helps you utilize your hiring muscle efficiently is through hiring analytics. Think about it. All you have to do is follow the data. For example, if you’re wanting to know which job boards/aggregators you should focus on in order to maximize the highest qualified applicant pool, take a look at your hiring analytics for recently onboarded superstar employees. From which medium did they come? If you’ve sourced properly (verified with the new hire where he/she actually found the job), then this step should be as simple as looking at the source for each hire and then posting a killer job ad to drive candidates to apply. We all know that a single piece of data is useless unless you have something to compare it against. Hiring analytics help you pinpoint areas for improvement. We all know that a single piece of data is useless unless you have something to compare it against, and hiring analytics is no exception. 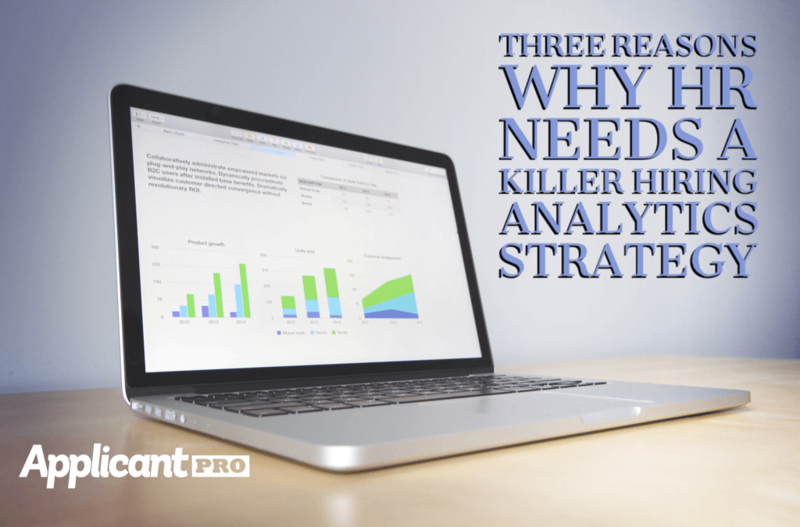 If you’ve designed a hiring analytics strategy that involves comparing and contrasting similar data, then you’ll have all the information you need to see potential holes in your hiring plan. If you do decide to test a hypothesis and change something up, (ie writing a new job ad for one of your open positions), try to stick to changing one thing at a time as that will make your data and the changes you see more reliable. Hiring analytics lay the foundation for bigger metrics. If you’ve been diligent about tracking your hiring process, then you’ll have all the information at your disposal to track and calculate bigger metrics like time-to-hire and time-to-fill because each step in your applicant’s journey is documented. From there, it should be a matter of slipping in numbers and then assigning a dollar amount to each hire, so that you know exactly how much your hiring/onboarding process costs the company. You have enough on your hiring plate already, so why not enlist the help of an ATS that will track all of your hiring analytics for you? Contact us for more information.